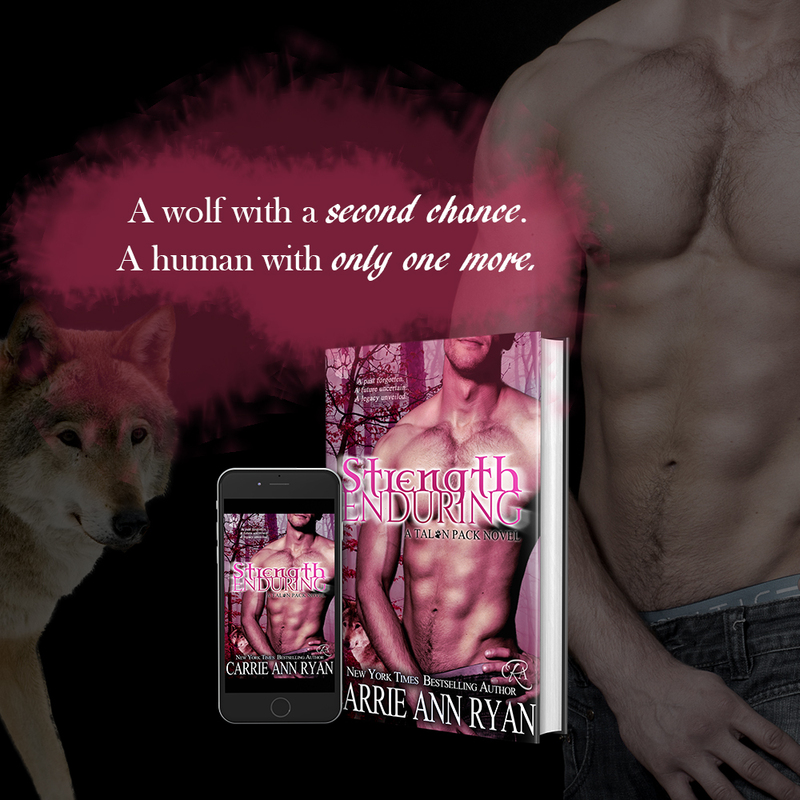 Strength Enduring is the 8th book in Carrie Ann Ryan's Talon Pack Series and is out Now! I am so excited that this book is out to the world now, I feel like I have been waiting ages for Dhanielle's story because, as with all the girls, we knew something was up but what was it? I can say that while it wasn't unexpected it took a curious turn for me which made this book all that more enjoyable. Dhanielle is one of four girls who have been mating by mating changing the Talon pack forever, and thankfully for the better. I loved how Carrie uses Danielle to further the storyline with out adding an entirely new and out there development. This is a series that could go on and on (and would we really truly complain, probably not) but it is wonderful to see how everything is playing out and know that eventually the Talon's as a Pack will have their HEA. I also really loved Kam. (Kameron) Here's this strong, gruff, dedicated to his role man who never gives himself a break and takes the world on his shoulders and yet he is so understanding and gentle with Dani. There is no uncalled for cockiness, or attitude. He's simply a man/wolf with a job that he loves and that he takes seriously. He is a man that wants the best for his 'people'. his community and he will work himself to the bone to make sure that they are all taken care of. You'd almost think he would have been a submissive if he weren't so obviously dominate. The best thing about these two together is that they hold each other up. Kam is there to walk beside Dani as she maneuvers through her new world, to encourage her, to give her credit where it is due, and allow her to make the journey she needs to make on her own terms but with him waiting to be there if he's needed. Dani, she is obviously Kam's safe space. His space to let himself be just Kam, to take the mantle of protector (except as protector to Dani) of the pack off his shoulders for a few minutes and breathe. She is there to support him and prove to him that love can be easy and soft, that he doesn't have to carry all the load, she can carry it with him . I can't wait to get into the next book, Forever Broken, Max's story. I loved how we got a good look at what we're heading into with the last book of the Talon Pack series. Like we have come to expect from Carrie Ann Ryan it is going to 'pack' (not to be puny) an emotional punch while giving us a beautiful romance to swoon over. I am sad that it will all be coming to an end, but so excited to see where the end leads! This is a book that is both sad and in a quiet way uplifting. I don't know where Carrie Ann's head and heart where when writing it but I know that when she wrote Eternal Mourning you could feel Carrie Ann's pain as she went through what I am sure has been the most difficult time in her life, you could also feel hope. In Strength Enduring you see can feel how her characters are also bringing feelisn of her own back into the story, I am not sure an author can ever not let their feelings bleed through their words but there are times like now for Carrie that I think it is even more pronounced. As I read Strength Enduring I felt emotions of acceptance and non-acceptance come into play. When Dani, fights back at the community refusing to accept that she isn't worthy because of her friendships, when she accepts her new world as she goes from living one life to living another. The feeling that nothing will ever be the same but that it will be okay, that these two characters, the entire Talon Pack can stand on their own with the support of those that love them. That Strength comes not from trying to prove that you can do it all but from accepting that people are there to stand with you as you take on a new reality all while holding tight to a past that has defined you. I can almost feel through Carrie's writing her own journey as she begins a new chapter in her life and I find it both heartbreaking but extraordinary and uplifting. Like Dani and Kam, Carrie Ann Ryan is her own force to be reckoned with and I think is finding that she is stronger than she ever imagined herself to be.